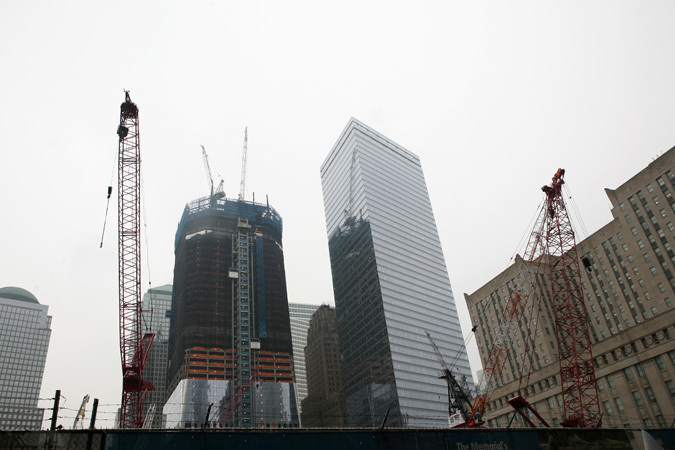 One World Trade continues to rise with the spire yet to come. 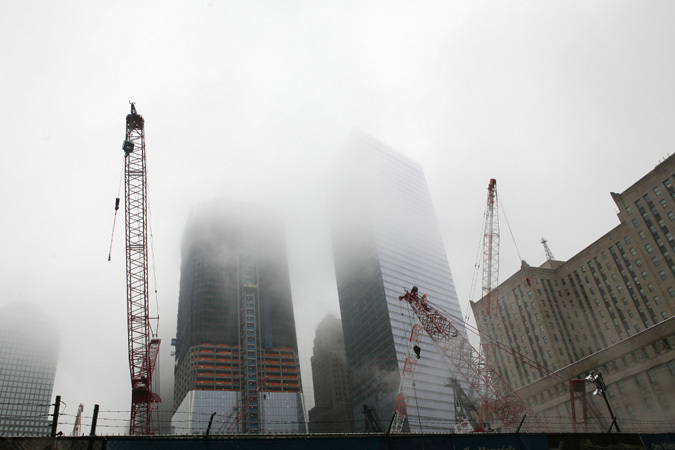 Today, the Port Authority gave AN access to the 103rd floor. In a mad dash we took a few hundred photos, which we quickly whittled down to these 34. What's missing are the sounds: workers shouting, metal clanging, and Queen's "We Will Rock You" playing from a radio on the ride up. 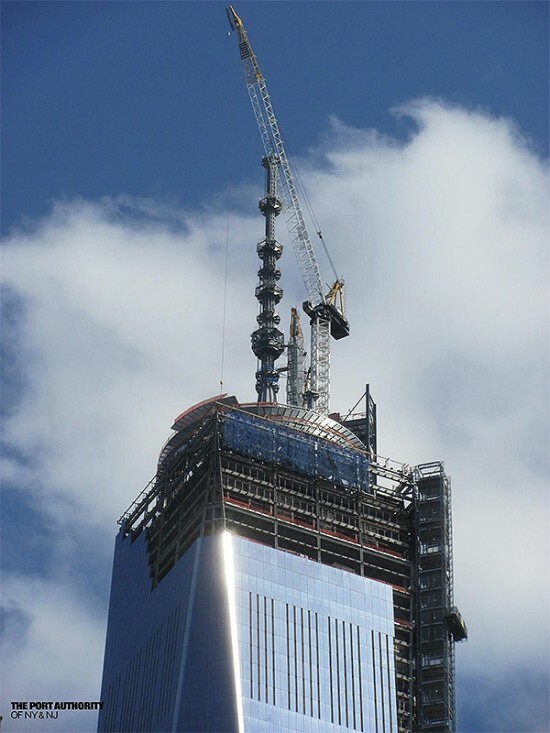 Tomorrow, we're stopping by to visit One World's little brother, Four World Trade. Click on a thumbnail to launch the slideshow. All photos by Tom Stoelker / The Architect's Newspaper. 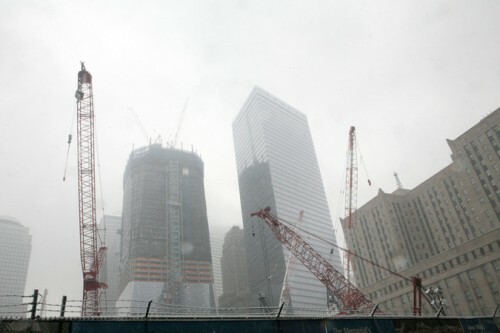 Hurricane Irene was no match for tenth anniversary preparations at the World Trade Center site. In fact, some are claiming that the storm could have been a good thing for the soon-to-be-open memorial site. Joseph Daniels, president and CEO of the Memorial Foundation, told The Observer that all the trees on the site, including the Survivor Tree, made it out of the storm unscathed. 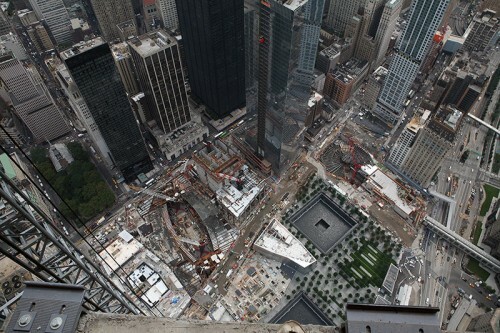 And at a depth of only six feet, the eight-acre plaza "lid" did seem quite vulnerable just a few days ago. While there was some minor flooding and dripping underneath the plaza, Daniels said, there was no major damage. If anything, Daniels was saw Irene's drips in a glass half full, pushing the project slightly ahead of schedule: "All the preparations we did in preparing for the storm actually helped prepare us for the opening, like removing excess equipment and temporary fencing that had been surrounding the pools." 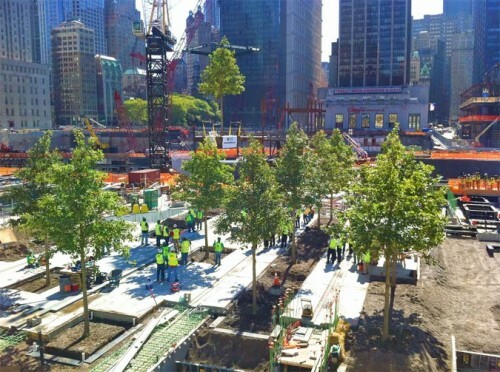 Today, the Port Authority and National September 11 Memorial & Museum announced the near completion of steel framing for the design's memorial pools. 99.8 percent of the project's 8,151 tons of steel has been installed to date. For what it's worth, when completed the Memorial will boast more steel than was used in the construction of the Eiffel Tower. In the coming months, workers will begin the installation of the granite panels that line the walls of the pools, which will be the largest manmade waterfalls in the country when finished, pumping 52,000 gallons of recycled water per minute. A mockup of the waterfalls was built in Brooklyn in January. Follow this link to see an AP video of memorial designer Michael Arad discussing the motivations behind the project. 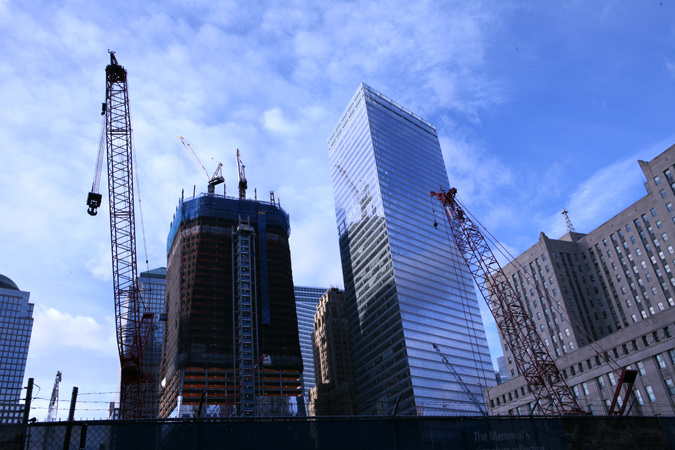 The Port Authority announced today that steel erection for One World Trade Center has reached the 20th floor, or 200 feet above street level. 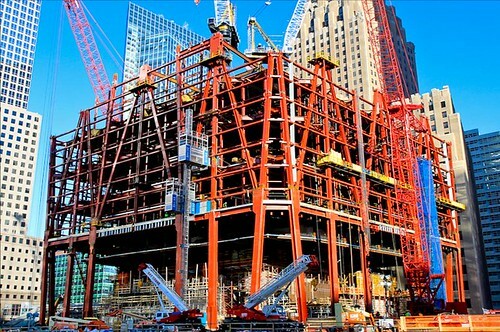 For this particular project, that means that 8,000 tons of structural steel have been installed by DCM Erectors—700 tons more than all the steel in the Eiffel Tower. Currently, ironworkers are installing 16 giant steel nodes, some as big as 175 tons, which will act as joints between the framing of the podium and the rest of the tower. From here on out construction should move much faster, and completion is expected in 2013. The first 20 floors required very complex framing, whereas the remainder of the erection will be standard office floors. 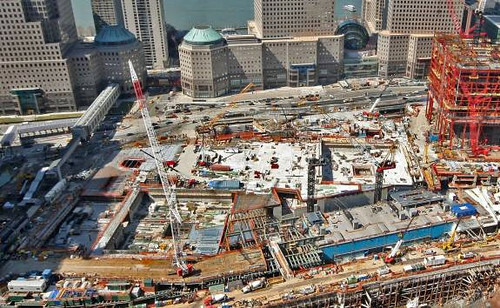 You can view more images of the construction at the Port Authority's Flickr page.